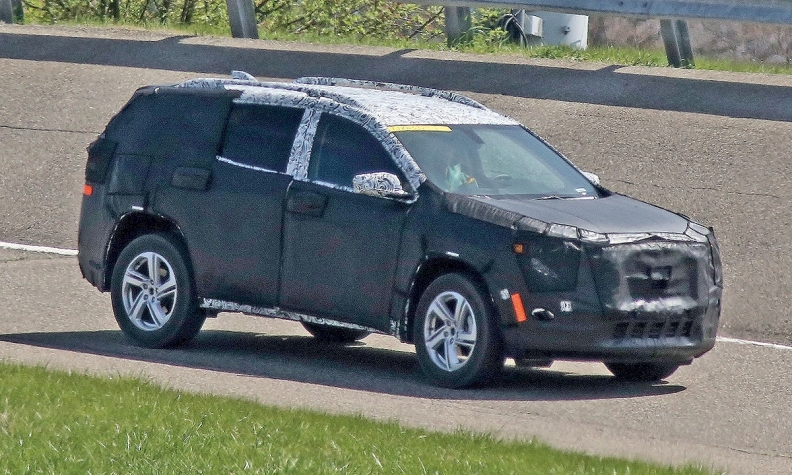 The GMC Terrain shown in this May 2016 spy photo appears to have a more steeply raked windshield and lower roofline than the outgoing version. DETROIT -- General Motors plans to debut redesigned versions of the Chevrolet Traverse and GMC Terrain at the Detroit auto show in January, a person with knowledge of the automaker’s plans said today. The two crossovers are expected to go on sale in late 2017, after the launch of the Chevy Equinox, a sibling of the Terrain. GM unveiled the Equinox in September. The Terrain and Equinox are built at the CAMI plant in Ingersoll, Ont. All three vehicles are among the oldest crossovers still on sale in the U.S. None has received a full redesign since GM’s bankruptcy in 2009, as the company prioritized more urgently needed overhauls. GM’s plans to reveal the 2018 Traverse and Terrain next month were first reported Thursday morning by The Wall Street Journal. A GM spokesman declined to comment on the report. GM is shifting its focus to crossovers -- which are among the industry’s hottest sellers -- in 2017 after working primarily on its pickup and sedan offerings in recent years. It recently began selling a redesigned GMC Acadia and is expected to reveal the second generation of the Buick Enclave, which was launched in 2007, at one of the auto shows that follow Detroit. Photos of a camouflaged Terrain caught testing last spring show the compact crossover taking on a less-upright profile than the current version. It is expected to ride on the same global compact platform that underpins the Chevy Cruze sedan. Analysts expect the Traverse to share a platform with the 2017 Acadia and be several hundred pounds lighter than the first generation, though it won’t shrink in overall size as dramatically as the Acadia did. Chevy plans to slot a new crossover between the Equinox and Traverse, possibly in 2018.